What if I told you, brace yourself, that if there was 1 product that could transform your skin, regardless of age, skin type, gender or skin concern: it’s sun protection. Almost all skin concerns are exacerbated by exposure to the sun; it’s hugely dangerous. Even in the dullest day in winter, you’re still being exposed to sun. If you’re sat inside, windows only protect you from around 20% exposure. Described as a Solid, wash-on sun protection, with calamine powder, cocoa butter and rose absolute. Use a one-third chunk, simply glide the bar over damp skin in the bath or shower, rinse off and gently pat your skin dry with a towel. So-so product; hate the smell. It’s like Soya Sauce. Probably wouldn’t recommend this product as an SPF10 isn’t going to do much at all this summer and unfortunately just not a huge fan of the texture and smell. LUSH Ltd also say it helps increase your melanin production which ideally is not what you want (a tan equals damage). With more gems than Jackie Collins; this super moisturiser for normal/dry skin is packed with honey, shea, jojoba and UVA/UVB protection. Leaves the skin ultra soft with a gentle tinted glow (it’s 100% not makeup, I assure you). Really loving this so far on my cheeks; they heave a sigh of relief in this incredible heat we’re having. Sunlight is broken into two parts, UVA (ageing) and UVB (burning). UVA penetrates the deepest layers of the skin and breaks down your elastin and collagen whilst UVB burns the surface levels. Skin burn is caused by these rays slicing through cells; your body produces that brown colour (melanin) to protect itself with a natural shield whilst your skin gets to work repairing itself. If your skin, at a base level, repairs itself incorrectly; the cells that come from the base level might reproduce incorrectly – this can be the beginning of skin cancer. It CAN happen; it DOES happen and it MIGHT happen to YOU. Once you know, it’s easy peasy. In the UK sun, you can be exposed for 15 minutes before you begin to burn. So, take your SPF number, let’s say SPF20 for example; then multiply it by 15. This will give you your total minutes exposure, so 300 minutes or 5 hours. Once the 5 hours (or however long) is up, that’s it, your skin can’t take any more sun, regardless of if you reapply (although do reapply during the time anyway to ensure you stay protected). I’m not going to go into much depth with this at all as why would you care what products would be recommended for my skin; they won’t be the same for you. But last night, whilst at the LUSH Ltd Leeds new store and spa launch, I requested a full skin consultation as I’d never really had one from them before (honestly have never been offered one). Char Day, the store’s skincare expert, spent a good 20 minutes with me going through all my skin concerns and finding suitable products to match (she was spot on with her recommendations). Char knew the products and ingredients inside and out, which isn’t uncommon for LUSH Ltd staff; they’re almost always die-hard lovers of the brand. I was recommended and sampled: Ultrabland cleanser/pre-cleanser; Angels on Bare Skin cleanser; BB Seaweed Fresh Face Mask (wearing it now as I type) and Gorgeous moisturiser. She did recommend an eye product but I’m hugely particular about what I use as my eyes are excruciatingly sensitive. I was asked to be treated like a customer and I honestly believe I was; I was sampled all the products giving me a good few days to 1 weeks worth of product to try. 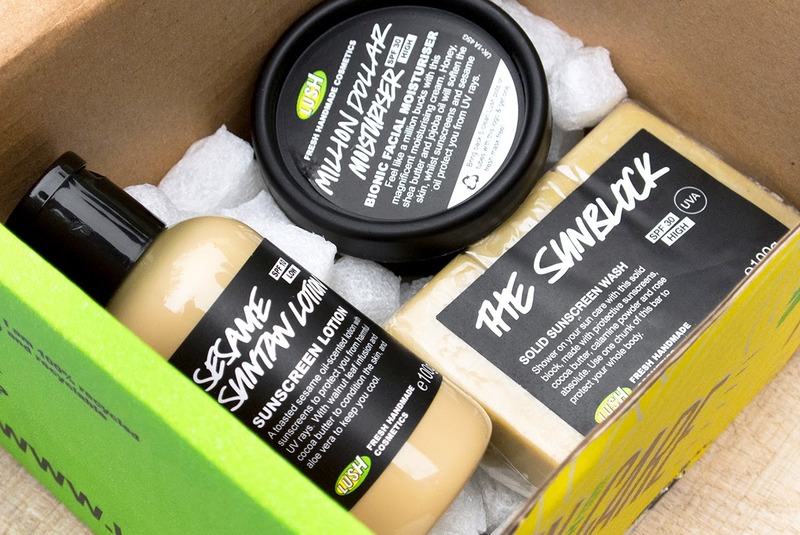 If you’re looking for a natural approach to any skin concern, particularly dryness or acne/blemishes and oiliness (LUSH Ltd seem particularly geared to both these concerns) then get yourself to your local LUSH Ltd store. Also, enter my giveaway to win a complete LUSH Ltd blemish busting skincare kit (ends Friday 25th June, 2014). Have you ever had a skin consultation from LUSH Ltd? If so, what were you recommended and do you have any favourite products? This article first appeared on MANFACE written by Thom Watson. It was published on Friday 18th July 2014 and was last updated on Monday 3rd April 2017 at 1:59pm. It's categorised under High Street, LUSH Ltd, Sun Protect where you'll find more related content.